Adorable baby Danie with his loving and attentive mom, Okey Dokey. He never stopped smiling and laughing the entire time they were visiting. 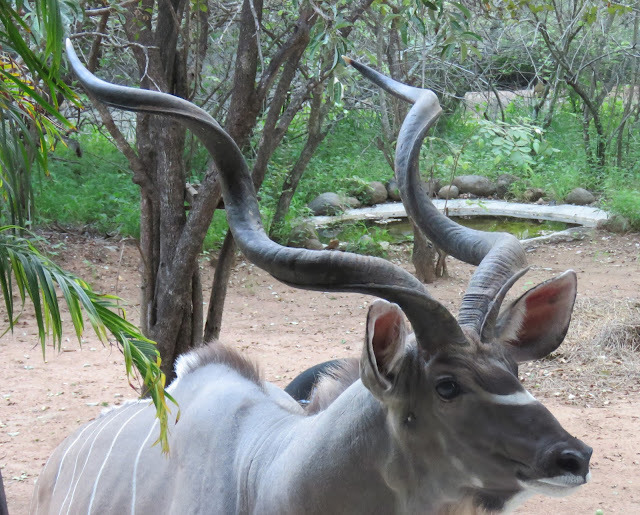 Kudus are spectacular animals. They are gentle and never hesitate to make eye contact. But, those huge antlers can be dangerous for both humans and other wildlife. We stay back when offering food and taking photos. There are so many people in Marloth Park right now, we're having trouble with the Internet. I tried downloading today's photos but wasn't able to do so for several hours. Now at almost 11:00 am, I'm still busy getting the post ready to upload. The larger male of the troop of Vervet monkeys, sitting in the tree next to the veranda where the bush baby house is located. There are 12 national holidays in South Africa many of which result in Mondays as the official "off work" day. As for this current holiday, Tuesday is the official May Day holiday since it's May 1st. This link will provide you with a list of the South African holidays. We've heard that people are being turned away to enter Kruger National Park during this busy period. Only 600 people are allowed into each of the eleven entrance gates throughout the massive wildlife area. He sat there for quite a while watching us. According to our visiting friends Okey Dokey and family, yesterday, people were being turned away if they didn't have a pre-paid reservation. And even many of those visitors with "reservations" were left waiting for up to two hours in order to enter the gate. The extra cost for booking a reservation, over and above the usual entrance fees (prices vary), is ZAR 38 (US $3.07) per person. Once inside every sighting is observed by dozens of vehicles. Oh, good grief. This enormous natural environment is taken over by commercialism during holiday periods, returning to it's quiet and enriching status that usually takes one's breath away. Soon, he was distracted by noise his troop-mates were making as they flew through the trees. Of course, we aren't going to the park again until well after the holiday period ends when most tourists have left the area. That's not to say there aren't others like us who are renting holiday homes during the quieter seasons who will still be here. Hopefully, they too, like us, attempt to blend in and become a part of this magical place. As we enter into the cooler winter season, beginning on June 21st, tourism in the area will taper off due to lower temperatures. This morning, both of us were outside on the veranda by 6:30 am bundled up to stay warm. Now, four hours later we're back to shorts and tee shirts. We tried for a better photo of this male bushbuck which is the darkest we've seen but I was distracted with our company and never took the time for a good photo as darkest fell. The cooler weather will not deter us from spending our days and nights outdoors. We'll simply add more layers of clothing to stay warm. It doesn't get much below 10C (50F) during most winter months. But, after all of these years of warm weather (except for Antarctica) these temps might feel awfully cold to us. Yesterday, before dusk, our dear friend, Okey Dokey, our driver here in Marloth Park four years ago, whose remained a great friend these past years, visited us with her husband and baby, both named Dani for snacks, wine, and beer. We'd never met the two Danis and adore them both. His coloring was much darker and he was considerably larger than other male bushbucks we've seen so far. A third Danie, of Louise and Danie, also joined us since they were also good friends with this special young woman. It was delightful to meet her two loved ones. It was as if we'd never missed a beat. How fortunate we are to have made such fine friends along the way! We were sad to see them go. But, adorable little Danie, now almost eight months old, was ready for sleep after they spent a very long day in Kruger, as they explained above, regarding gaining entrance into the park. I wish I'd taken better photos of our visitors but sometimes, I'm just more interested in the people than the photos. Louise is next to Okey Dokey and Okey Dokey's husband Danie is seated to Tom's right. Louise's Danie and I were at the far end of the table. Who knows how long it will be until we see them again? They've invited us to visit them at the "farm" a five-hour drive from here. Perhaps, at some point during our remaining months in South Africa, (immigration permitting) we'll visit them. Soon we're off to the little market at Marlothi Centre for a few items for tonight's dinner and more carrots and apples for our wildlife friends. It will be a quiet few days for us with no plans to travel any further than the little market, as the holiday season continues through Tuesday. We hope you have a quiet and pleasant day wherever you may be! Map of the world illustrating how the International Date Line effects each side of the line. One year ago we crossed and we had two May firsts. Please click here for details. This is a common sight in Marloth Park this weekend. It's packed with tourists sitting in the back of a "buckie" which is Afrikaans for "pick up truck." Little Wart Face stopped by for a nap. Last night, our friends Kathy and Don, joined us for dinner at our bush home. We prepared a nice meal without too much fuss so we could enjoy sitting on the veranda on a perfect evening, enjoying our lively conversation and the sounds of night in the bush. Tourists began arriving in Marloth on Thursday with many staying through Tuesday, the end of the five-day holiday weekend, the traffic has been outrageous for this conservancy. The otherwise quiet dirt road on which we live is experiencing a steady stream of cars, day and night. Midday on Friday, this was Olifant Road, the paved main road in Marloth Park. We couldn't believe how many cars and people had entered the park for the holiday weekend. Kathy and Don, who live along the Crocodile River said they've also seen a steady flow of traffic on their usually quiet dirt road as well. We'll all be glad when the holiday ends. When we took off for a drive in the park on Friday we didn't expect to see much and then, these wonderful elephants! No offense intended for tourists. But, the calm and quiet residents hold in high regard is often disturbed during the busy holiday season. When Louise and Danie stopped by for a visit yesterday, they mentioned it felt as if there are more tourists here now than there was at Easter or even this past Christmas season. A male impala in the bush. This is a dilemma for people who own homes here. The community needs the revenue generated by tourists staying in holiday homes and spending money in restaurants and shops but they can't help but feel frustrated by a handful of tourists who play loud music, talk loudly and are inconsiderate of the wildlife and trash disposal. The majority of the tourists are thoughtful of the "rules of the park." Last night, after we cleaned up (Tom did the many dishes) we wandered back outside to the veranda to see if any visitors would stop by. During the busy holiday seasons, few animals visit their usual haunts. Several youngsters with two moms, cooling off and drinking in the Crocodile River. We haven't seen Scar Face, Wart Face or Frank since Friday and only a few bushbucks, kudus and the usual zillions of guinea fowl have made an appearance. This is typical when there are lots of people are in the park. Hopefully, by Tuesday or Wednesday they'll return to their usual routine and so will we. One elephant was off at a distance. Could this be a male who soon will be banished from the family unit? In the interim, we're staying put. Early this morning we did a load of laundry and hung it on the clothesline. Now as the sky has turned dark and cloudy we may have to bring it inside before it rains. Few people have clothes dryers in South Africa, or for that matter, in many parts of the world. Included in our rent is our wonderful Marta who gladly will do all of our laundry. She washes and hangs up the sheets each week. In the interim, Tom and I don't mind washing our clothes and hanging them to dry. We will never tire of seeing elephants. They are such majestic and mysterious animals. Since we have so few items and only so much underwear, we tend to do laundry more often than some. By doing it ourselves we don't have to wait a day or two until the next laundry day, especially for items we wear frequently. I sleep in a Celebrity Cruise Line tee shirt that Tom didn't want when it had words on it. He doesn't like words on his clothing. It's currently the only warm weather sleepwear I own. From this site: "Elephants may spend 12-18 hours a day feeding. Adult elephants can eat between 200-600 pounds of food a day. As herbivores, elephants consume grasses, tree foliage, bark, twigs, and other vegetation daily. Elephants can also drink up to 50 gallons of water a day about as much as a standard bathtub holds." In our old lives, I had a wide variety of attractive sleepwear in varying colors and styles suitable for all weather conditions. Not the case now. I wash the one tee shirt in the hopes it will dry by bedtime. If it's too humid for it to dry (often the case), I'll "borrow" a different tee shirt of Tom's for the one night. He doesn't mind a bit. There's is one item of clothing I really miss... a long fluffy bathrobe. A few holiday homes have had robes but they're often intended for much shorter people than the two of us. Wearing a robe that barely covers one's backside is uncomfortable. We have no room in our luggage for robes, never have, never will. Guinea fowl and zebras snacking on pellets in the yard. It's a small and insignificant sacrifice. After all these years we give little thought to the "stuff" we had in our old lives. Sure, at times, I think that a food processor would be handy. I'm always chopping and dicing for our meals and it would be so much easier with this handy kitchen appliance. In the realm of things, I guess it just isn't that important. With two more days until the crowd thins out and our wildlife friends return, we'll busy ourselves with "human" friend such as Okey Dokey and her family coming for happy hour today. Louise and Danie will join us. I'd better get back in the kitchen and finish some chopping and dicing for some snack for this afternoon when our guests arrive. And, I see at the moment a few raindrops are falling. We'd better take the clothes off the line! A fancy outhouse on a tropical island. For more photos, please click here. Scar Face's right eye is above the injury but may have been affected. We have no delusions about life and death in the wild. It's all a part of nature. Wild animals kill for food and seeing this occur while on safari the first few times is a heart wrenching experience for many. We were no exception. In time we came to accept the "pecking order" realizing that if one cares to embrace the bush, revels in the wild and participate in photo safaris, seeing these events is inevitable at one point or another. In actuality, witnessing such an event, although harsh, can be a life-changing experience as we mature and grow in our vast appreciation of the animal kingdom worldwide. He stops by several times each day and we always feed him generously. He needs food to help him heal. In Marloth Park, there are few predators that hunt and kill the wildlife located within the park. On occasion, there's a sighting of a lion, a cheetah, wild dogs or hyenas. It's not unheard of for residents to occasionally spot a carcass in the park, left behind for the vultures next meal. In the day to day existence living in the park, primarily it's a happy place, filled with loving kudus, skittish duikers, gentle bushbucks and determined zebras, clomping through the bush with heavy hooves. easily alerting us to their arrival. At the beginning of his injury, each day it looked worse than the prior day. We were very worried. He was so busy eating, we had a hard time taking photos. Of course, there are dozens of other species we see weekly including the "small and smaller things" such as insects, lizards, mongoose, rodents, birds, rats, snakes and many more. As a result, we seldom have seen injuries and/or death of wild animals in Marloth Park. Like I said, "it's a happy place" for both grownups and children who can learn so much in this magical environment. We were fearful of reporting his injury to the rangers. See the reasons in the text. But, when several weeks ago, a special warthog stopped by to see us, we were shocked by what we saw, the right side of his face had obviously been severely stabbed by either the antler of a large antelope such as a male kudu or wildebeest, during an altercation with another warthog or as he ran into a protruding branch of a tree when he was on the run. We've seen how fast warthogs can run, upwards of 48 kilometers (30 miles) per hour. We've also seen them dash through the yard at such high speeds when they become frightened, making it entirely possible for Scar Face to have run into a protruding branch. At times, he was covered in mud. Was that his way of attempting to heal the injury? We'll never know what happened to him to cause this horrific injury. All we know is we didn't want to report his injury to the Rangers, who when they'd see such a devastating injury may have decided euthanasia was the way to go. We had hope. We didn't report it. At times, his good friend Mutton Chops come to visit with Scar Face. They get along well when sharing the pellets. (Previously posted photo). If at any time, we'd seen him failing, unable to eat, lying in the yard and in great distress, of course, we'd have had no choice but to report it. When he's showed up in our yard several times a day looking for some quick and easy nourishment, we anticipated we'd made the right decision to "wait and watch." Certain animals in Marloth Park, when injured or ill will be treated by volunteer medical professionals after which they'll be returned to the wild. Recently, a bushbuck's leg was caught in a scare and had become infected. The injured bushbuck was darted, treated and released. Was it actually improving a little, we wondered? Unfortunately, warthogs, who multiple prolifically and are quite sturdy don't fall into a category of a species that the Rangers and medical professionals feel are "worthy" of being treated. Many warthogs are culled each year. Many are left to fend for themselves when illness or injury strikes or are euthanized if they can be found. As the days passed, Scar Face began to look better and better. Some days, his face was covered in thick mud which he must have been using to heal the serious wound. Animals are amazing and many are intelligent enough to care for themselves and for one another using available resources in the wild. It has been heartbreaking thinking he's been in pain. He's come to visit every single day eating a massive number of pellets, apples and other vegetables and frequently drank from the cement pond in the yard. He'd scratch his face on a tree. There's no doubt that as the wound began to heal, it became itchy. Danie told us that warthogs like to eat bones. We cooked meats and saved all the bones for him. He especially loves the bones, easily chewing them. Warthogs are omnivores and not only graze on grasses, roots, and tubers but will eat dead animals encountered in the wild, although they won't hunt for meat. Now, the injury appears to be drying up and he seems more animated but extremely cautious around other animals other than a few friendly warthogs, like Mutton Chops and Little Wart Face (as opposed to big Wart Face who's very grumpy). Each time he stands in the dirt near the veranda staring at us, asking "What's to eat today?' We can't help it as we both jump to our feet, scurry around gathering foods for him. We stand on the edge of the veranda tossing food to him which he enthusiastically devours. Now, as we see him looking so much better, we can only hope he'll remain on the road to recovery. No doubt, he'll continue to return as we carefully and hopefully watch his recovery progress. We're thrilled, to say the least. Then suddenly, two days ago, he started looking better with less oozing. Tonight, friends Kathy and Don are coming for dinner. With all the socializing we'd done with them four years ago and also since our return to the park, this will be the first time it will be just the four of us. We plan on an enjoyable evening. Tomorrow, at 4:00 pm, Okey Dokey, our dear friend and former driver in Marloth Park in 2013/2014 is coming with her husband and baby, whom we've yet to meet, for happy-hour along with Louise and Danie. We've stayed in touch all these years and are excited to see her and her family. It will be a great weekend, for sure. May your "May Day" weekend be busy with those whose company you especially enjoy! A tiny rowboat at the ready in the Isle of Pines in the South Pacific. For more photos, please click here. We shot this photo of the Crocodile River while standing at the brick overlook. Now with the five-day May Day holiday and many tourists in the park, we won't be returning for several days. Happy caterpillar dancing across the floor! The five-day holiday observation include today's Freedom Day (Freedom Day is a public holiday in South Africa celebrated on April 27th each year. It celebrates freedom and commemorates the first post-apartheid elections held on that day in 1994) and then the May Day celebrations begin. See this link for details. Once again Marloth Park is packed. 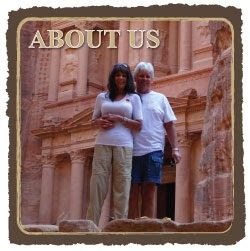 All of Louise and Danie's holiday rentals are totally booked (not unusual for their exceptional properties. There's an endless stream of vehicles along our normally quiet dirt road, and the shops and restaurants will be packed over the weekend until Tuesday when the festivities come to an end. Yesterday, we didn't see any wildlife along the Crocodile River although the scenery is always stunning. With company coming for dinner tomorrow evening (friends Kathy and Don) we plan to stay put over the next several days. We have plenty of food, drinks and supplies on hand and a plan to make a great dinner not only tomorrow but for the remaining evenings as well. Yesterday around noon, with the post done and uploaded, we decided to take one more bumpy drive on the dirt roads in Marloth Park to see if we'd discover any special sightings. Whether it's a turtle or a lizard on the road, a parade of elephants along the river, or a bloat of hippos lounging in a pool of water, it all matters to us. We didn't see much wildlife on yesterday's drive in the park. This ostrich made the day! As we drove over one outrageously bumpy road after another, seeing very little, which can be attributed to the increased traffic in the park, we decided to call it a day and head to Daisy's Den for more birdseed and a few items we needed for the weekend. Male ostriches typically have black feathers while females and youngsters are a greyish brown color. It's such fun going to any one of the three little shopping centers here in Marloth Park. Talk about a small town feel! These are oozing with charm and quaintness leaving both of us enjoying any necessary shopping runs we may make throughout the week to fill in on any items needed. The pickings are slim in either of the two little grocery stores carrying just the basics. At times, we're surprised by the nice produce and odds and ends we may find that prevent us from the necessity of the long drive to Komatipoort for only an item or two. A male kudu resting in the bush from the hot midday sun looking our way as we shot this photo. The drive to the Marloth Park shops is three minutes. The drive to Komatipoort is 20 to 25 minutes depending on what big trucks we're stuck behind on the two-lane road. Back at home by 2:00 pm, the moment we stepped out of the little blue car we realized we had visitors...unwanted visitors...a troop of baboons. Luckily, there isn't much they can destroy on the veranda at this house. Sure, they could ruin the cushions on the outdoor chairs but the potted plants are simply too heavy to tip over. At a distance, we could see these two young baboons playing in the yard. There are some decorator items on the stucco walls and both a gas grill and wood burning braai (grill) neither of which seem to appeal to baboons on one of their destructive rants. Weeks ago we knew they'd been here when we found poop, baboon poop, all over the veranda and cushions from a few chairs tossed about. We cleaned up the stinky mess and put everything back in order. As we kept a watchful eye on yesterday baboon invasion after closing the doors to the house, we heard several loud crashes coming from next door. Maybe they were heading our way next! Tom grabbed his big stick designated for precisely this type of situation, which if he holds over his head cause the baboons tend to freak out and run away. It worked perfectly. We immediately shut the doors to the house. Once baboons enter they can tear a house apart. After we were assured they were gone from the general area, Tom walked next door to check out the damage, taking these photos we've shown. If they'd turned over a trash bin, he could set it upright to avoid more baboons and Vervet monkeys coming to eat from the garbage which often occurs. That's why homeowners have wired or steel cages to hold their trash until pickup arrives. It didn't take long to see we were surrounded by the destructive animals. Luckily, they never returned the remainder of the day. We spent the evening as usual, on the veranda enjoying our dinner and watching a variety of "friends" come and go. We heard several loud crashes from the house next door where no one is living right now. Rina and Cees had left to return to The Netherlands. The baboons broke many clay pots as shown in these photos. Tomorrow, we'll share the heartfelt story of an injured animal we've come to know and love and how we've attempted to help him a little as he hopefully recovers soon. What a shame. I suppose this lighter weight pottery makes no sense in the bush. Have a lovely day and evening! Clouds above the pretty beach in the Isle of Pines, a port of call on last year's cruise. For more photos, please click here. this female, one of two moms that stop by each day. The interaction with wildlife is not only educational but also humorous. Each day, we spend hours watching their behavior. 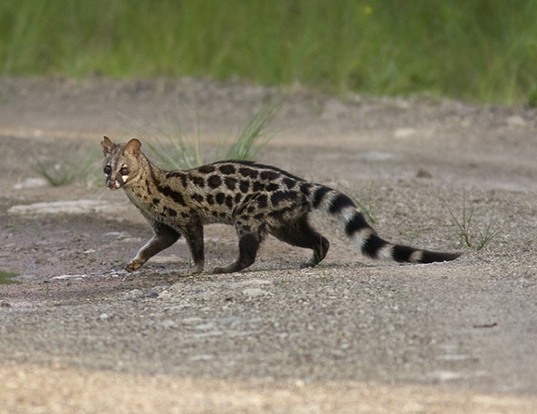 A genet as shown in this photo (not ours) appeared last night while we were packing to go inside for the night. Unfortunately, I'd already put away the camera. By the time I went back inside to get it the genet was long gone. Now, I suppose, we'll be hell-bent on seeing this lovely cat again and taking our own photos. We've had few quiet mornings in Marloth Park since we arrived two and a half months ago. Whether it's the four dozen helmeted guinea fowl that live in the bush surrounding our house, a single kudu or a forkl of kudu, a sounder of warthogs or Frank (the francolin) and his wife, it's always a busy morning. A good-sized turtle crossing the road. Often, they begin to appear once we're up and about but on a rare occasion, as soon as we open the big wooden doors to the house, a variety may be awaiting us. "What's for breakfast," their eyes asks as they stare at us. Wildlife in Marloth Park is used to being fed. A part of this outrageous adventure are the sounds in the bush both day and night including an indescribable variety of bird calls, cricket chirps, impala barks, hog snorts, frogs croaks (only the males croak) and the frequent sounds at a distance, often hard for us novices to decipher. In time we will learn. Three young monkeys playing in the dirt in front of the veranda. For now, we sit back in a perpetual state of wonder, rarely ever missing a beat. The rustling in the bush is often a good indicator that an animal is approaching. My finely tuned hearing is quick to pick up on a pending arrival for which I quietly alert Tom while we both wait in anticipation as to who will grace our presence in the next minute or two. They are highly social and spend considerable time playing with their troop-mates. With Tom's years of hearing loss from "working on the railroad," with difficulty hearing certain tones, he's often dependent on me to let him know someone is approaching. But, then, his keen eye often spots action in the bush long before I see it. We're a good team as observers of wildlife in the bush (along with other things). Monkeys use rocks and boulders as tools to open nuts and fruit. One may ask, "What do we have to gain from this?" Other than the joy of knowing we're providing some sustenance for the wildlife who often suffer during droughts, why do we have this peculiar passion, that us and many homeowners and visitors to Marloth Park and nature reserves throughout the world also possess? As populations of wildlife diminish worldwide due to human intervention and a natural cycle of life, death and extinction, we've added the experience of seeing and being entrenched in the beauty of nature and wildlife which our great grandchildren may never be able to see. Monkeys such as this Vervet, come by in troops, swinging through the trees and carrying on in our side yard. Vervet monkeys are smaller and less destructive than baboons. Perhaps our stories and photos here will provide them with a peek into "what it was like" decades ago to help them have a better understanding of cyclic changes in nature precipitated by myriad forces often beyond our control. This monkey picked up this pellet off the ground and wiped off the dirt before eating it. Did "humankind" wipe out the dinosaurs? No. Nature did. Any maybe, just maybe, nature naturally has played such a role over the millennium. Once, humans weren't on this earth. Will one day we be gone as well? We don't know, nor can we accurately surmise or assume we can change what is yet to come in our destiny. This is a blue-tailed day gecko we often see close to the river. In the meanwhile, many of us are given the opportunity to play a role, however small and seeming insignificant in the realm of things, that may or may not impact the future. If doing so, brings us peace and purpose then the effort and dedication was valuable and meaningful. Our cute little bushbuck baby with her mom on the left is growing up quickly. Some may say, everything we do is for our own personal pleasure. And, we'd be foolhardy to deny that reality. But, if somehow through our daily stories and photos we can provide a moment of pleasure to others throughout the world who may be reading our posts, then this daily commitment was all worthwhile. For this, dear readers, we glean our greatest joy. For this, dear readers, we thank all of YOU. The coral reef in the Isle of Pines was exquisite. For more details, please click here.